Super excited ko nung 11.11.11, for one thing, ang daaaaming ganap! Started my day with a lunch in the all-new Sugarleaf health shop in Makati (MEDICard Lifestyle Center corner Paseo de Roxas and Gil Puyat Streets). Went there with fellow blogger Kaye Awatin--since I know vegetarian din si gurl and she'll totally love the place also! Kaye bought packs of these nachos! Sugarleaf pertains to stevia, a plant whose leaves possess an intense sweetening capability. Though somewhat controversial in its earlier years, stevia is totally safe and is highly regarded because it has anti-oxidant properties, has zero calories, and doesn’t affect blood sugar levels. Sugarleaf imbibes sweetness, happy thoughts and feelings linked with healthy living and organic lifestyle. The most interesting ceiling. :D Gusto ko nito sa room ko, hehehe. 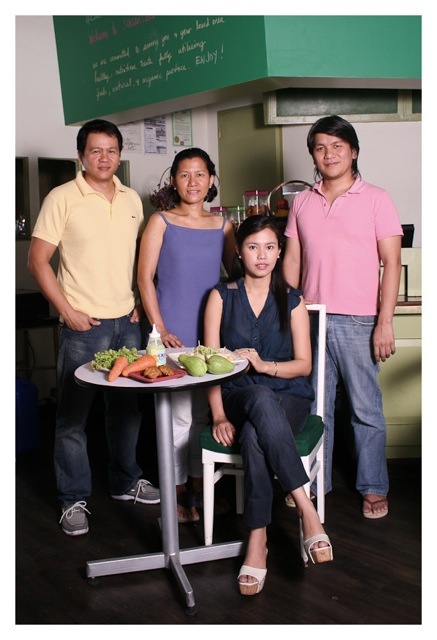 I love the mango dressing..
Syempre, hindi namin pinalagpas ni Kaye ang photobooth! ;) Hehe! Had a great time with Kaye! She's super easy to talk with kaya chill lang kami the whole time! :) It's cool also to have someone na karelate lang when it comes to our vegetarianism. :) More bonding times soon Kaye! Bitin! Healthy meals, snacks and beverages will also be available for both dine in and take away fully utilising the fresh produce available. Both restaurants have a cozy dining area of up to 30 persons is available for intimate events such as reunions, etc. Workshops on organic farming, healthy cooking and other wellness workshops will be offered in the coming months. Visit Sugarleaf Makati branch is initially open 8am to 9pm Mondays to Saturdays. Tel (63 2) 892 7323. Grabe... When I saw the very last photo, sobrang napa-reminisce ako kase meron tayong ganyan!!!! WAAAAHHHH I MISS YOU ANA!!!!!!!!!! I used to be a vegetarian, too, girl. ...and then I got pregnant and the meat cravings were just insane. Haha. Love your photobooth pics!! Especially the upper right one. Are you vegetarian din Ana?